For the ancient region, see Messinia (ancient region). 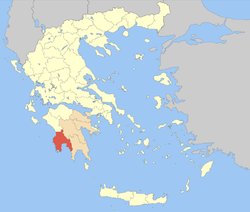 Messinia (/məˈsiːniə/; Greek: Μεσσηνία Messinia, pronounced [mesiˈnia]) is a regional unit (perifereiaki enotita) in the southwestern part of the Peloponnese region, in Greece. Until the implementation of the Kallikratis plan on 1 January 2011, Messinia was a prefecture (nomos) covering the same territory. 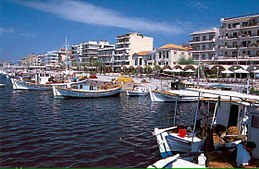 The capital and largest city of Messinia is Kalamata. Messinia borders on Elis to the north, Arcadia to the northeast, and Laconia to the southeast. The Ionian Sea lies to the west, and the Gulf of Messinia to the south. 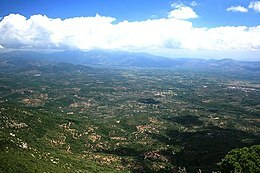 The most important mountain ranges are the Taygetus in the east, the Kyparissia mountains in the northwest and the Lykodimo in the southwest. The main rivers are the Neda in the north and the Pamisos in central Messinia. Off the south coast of the southwesternmost point of Messinia lie the Messinian Oinousses islands. The largest of these are Sapientza, Schiza and Venetiko. The small island Sphacteria closes off the bay of Pylos. All these islands are virtually uninhabited. Climate may vary, in the lowlands, temperatures are a bit warmer than Athens. Snow is not common during winter months except for the mountains, especially the Taygetus. Rain and clouds are common inland. Before the 2010 reorganization, Messinia was a nomos (prefecture) containing 29 dimoi (municipalities) and 2 koinotites (communities). Since 2010, Messinia has been a perifereiake enoteta (regional unit) containing only 6 municipalities, but with the same population, as it did not change area in the reorganization. Some 25 municipalities and communities were incorporated politically into the other 6 according to the table below, becoming municipal units. Like all provinces of Greece, they were abolished after the 2006 local elections, in line with Law 2539/1997, as part of the "Kapodistrias reform". 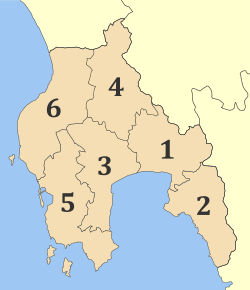 Some of the enlarged municipalities (demoi) created in 2011 have a territory similar to the former provinces. The economy of Messinia is primarily based on agricultural production although in recent years efforts are being made toward the development of activities in other sectors such as tourism. Main agricultural products are olive oil, Kalamata table olives, figs, and black raisins (sultanas). The variety of agricultural products is complemented by a small amount of stockbreeding products (beef, milk, sfela cheese, honey) and fish from the Gulf of Messinia. There are many small- and medium-size firms involved in the processing and standardization of agricultural products as well as a number of enterprises devoted to wood processing, furniture manufacturing, and metal construction. 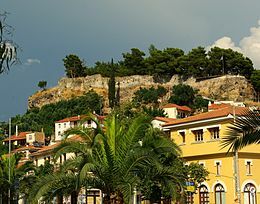 The Karelia tobacco company is based in Kalamata. The main airport in Messinia is Kalamata International Airport (KLX). Messinia is mentioned in the oldest work of European literature, the Iliad. The name undoubtedly goes back to at least the Bronze Age, but its origins are lost in the world of mythology. The region was one of the largest that was conquered and enslaved as helots by ancient Sparta. In the Middle Ages, Messinia shared the fortunes of the rest of the Peloponnese. Striking reminders of these conflicts are afforded by the extant ruins of the medieval strongholds of Kalamata, Coron (anc. Asine, mod. Korone), Modon (Methone) and Pylos. Messinia was a part of the Byzantine Empire. Much of Messinia fell into the hands of the Ottoman Turks, a part of the area remained with the Venetian Republic. In 1534 a group of families, known as the 'Coroni', settled in Piana degli Albanesi in Sicily. They were Arvanites and Greeks from Koroni. During the 1680s, the whole of Messinia was regained by the Venetian Republic in the Morean War, and formed part of the "Kingdom of the Morea" until recovered by the Ottomans in 1715. The Mani Peninsula, a part of modern Messinia, was autonomous from Turkish rule due to the fact that it had no harbors. Messinia became part of independent Greece as a result of the Greek War of Independence (1821-1832). The famous naval Battle of Navarino took place near present Pylos in 1827, and was a decisive victory for Greece and its allies. The population in the area of Kalamata and Messine increased from 30,000 before World War II up to nearly 80,000 in the present day. Messinia suffered damage from the 2007 Greek forest fires. Hellenic Interior Ministry (18 March 2001). Δείτε τη Διοικητική Διαίρεση (in Greek). Hellenic Interior Ministry. . The previous Kapodistrias organization of all the communities in Greece. The populations are from the Census of 2001.
η Βουλή (11 August 2010), "ΤΕΥΧΟΣ ΔΕΥΤΕΡΟ", ΝΟΜΟΣ ΥΠ’ΑΡΙΘ. 3852: Νέα Αρχιτεκτονική της Αυτοδιοίκησης και της Αποκεντρωμένης Διοίκησης − Πρόγραμμα Καλλικράτης (PDF) (in Greek), ΕΦΗΜΕΡΙΣ ΤΗΣ ΚΥΒΕΡΝΗΣΕΩΣ ΤΗΣ ΕΛΛΗΝΙΚΗΣ ΔΗΜΟΚΡΑΤΙΑΣ . Part 2 of the Kallicratis Plan law, No. 3852, by the Hellenic Parliament (Βουλή), publishing a table of all the official communities of Greece arranged in hierarchical order. The lowest-level populations are from the Census of 2001. All higher-level populations are the sums of the appropriate lower-level populations. Kontogiannis, N.D. "Settlements and countryside of Messinia during the late Middle Ages: the testimony of the fortifications," Byzantine and Modern Greek Studies, 34,1 (2010), 3-29. This article incorporates text from a publication now in the public domain: Chisholm, Hugh, ed. (1911). "Messinia" . Encyclopædia Britannica (11th ed.). Cambridge University Press.